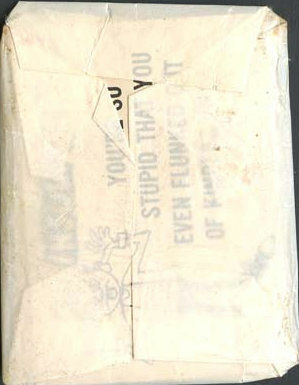 Yonks ago, when I made two posts (here and here) about the old salesman's sample strips Topps used to print up and send to their wholesalers and the like, there were four strips I could not find scans of. And yes, I know that I ended that last sentence with a preposition and, also, that a lot of the scans on those old posts are fuzzy as can be. I'll probably amend those fuzzballs someday but for now, will have to be content with filling in some of the missing examples. It appears that Topps could manipulate the reverses to allow an area for an address to be added, so these samples were used in a couple of different ways at least. 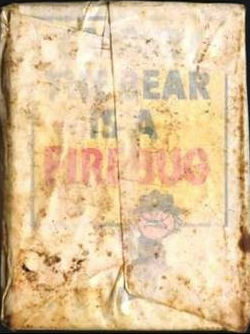 I'll hopefully have the other missing samples (from 1953 & 1956) up shortly. 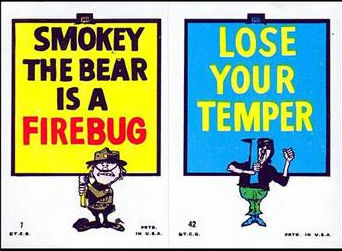 And if I can get a few more scans, I'll show the larger, "4x4" and "8x8" versions that they issued in a couple of years in a future post. A visit from the Turk is a phrase I associate with roster cut downs in pro football, namely one that does not result in a good outcome for the player visited. The origin of the phrase is murky at best but the Turk was a team employee who knocked on a player's dorm room door in training camp and told him he had been cut from the team. Fun job. 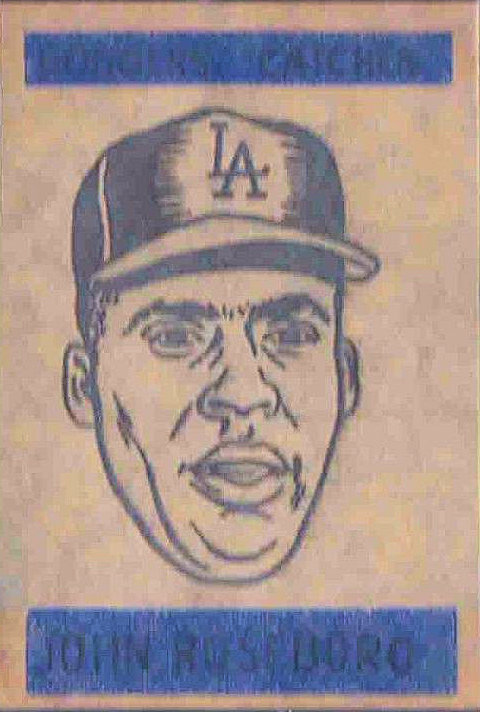 A different Turk who did a lot of work for Topps, namely Ameen (Turk) Karam, was a scout for the Cubs, Yankees and Dodgers and it was he who signed a lot of baseball players to Topps contracts beginning (I think) in 1950 while he was still scouting for the Bums. Turk had access to the clubhouses and was a hard worker at getting players to sign with Topps. 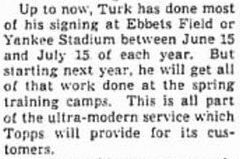 An article from the Berkshire Eagle on August 7, 1952 mentioned he did most of his signings between June 15 and July 15 but would soon change his methods to something ultra-modern! I had never heard of Topps planning a 1952 NFL set until I read the article. Things must have changed rather quickly as we know they released no such product and would not have a real NFL set until 1956, after they had bought out Bowman. So I'm thinking Bowman got wind of it and squashed it. I am further thinking Bowman then decided they needed to bring their 1952 Football cards up in size to something approximating the Giant Size cards Topps introduced in 1952 as a result. Hence the small and large sized offerings from Bowman. That picture is taken from the 1962 Topps Rookie Banquet program. Turk was only 54 years old when he died on May 29th the following year of a heart attack, which occurred in the Topps offices at Bush Terminal. I have no idea why but I started thinking about Bush Terminal this morning and decided to poke around a few of the more esoteric corners of the internet accordingly. 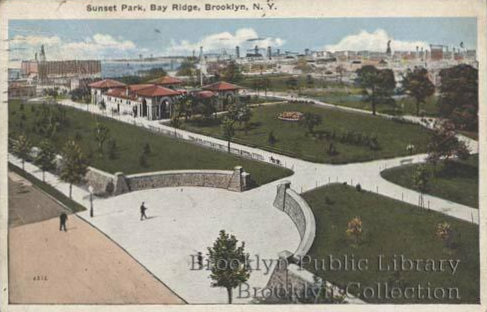 The two right-most buildings of the three shown in this detail, housed Topps, although they only had one when the moved in to the complex on June 1, 1946, a 237 37 St address, which is the right most building of this trio. Those shots are from the New York City Municipal Archives, although I nicked them from www.trainweb.org where the rail features are of interest. See how they snake between the buildings? 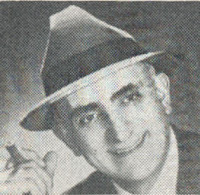 Woody Gelman and his carpool used to park under the viaduct. He probably walked in the front door here thousands of times. Fancy, huh? Sorry, I don't recall who sent me that shot! 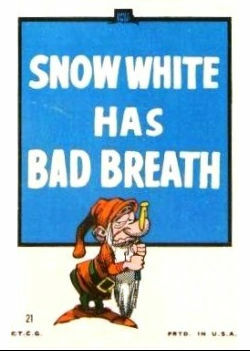 Looks like the sign uses the same Franklin Gothic Condensed inspired font used by Topps back in the day. 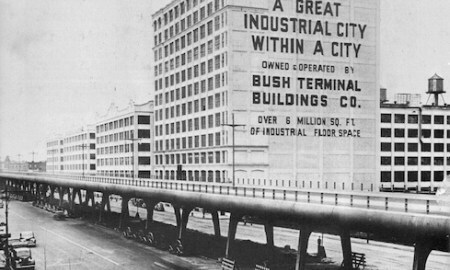 A concise early history of Bush Terminal can be found here if you are interested. HAPPY BIRTHDAY TO THE BLOG-10 years ago yesterday I made the first post here. Crazy! 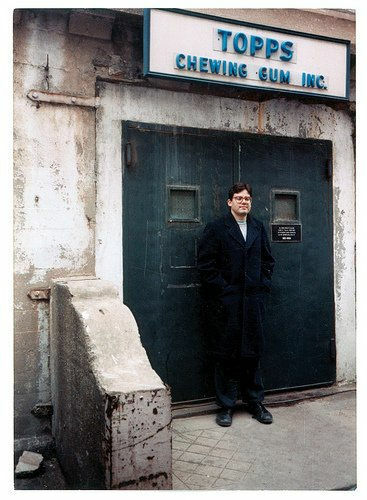 Lonnie Cummins, a close, personal Friend o'the Archive, has been sending along some stellar stuff lately as your blogmeister has been dealing with real world issues, which are now happily concluded! However, I must caution you that both Lonnie and I missed this unbelievable box a couple of months ago, because, well, the internet. 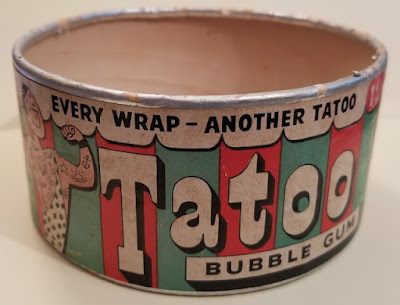 I have written here extensively about Tatoo, a set issued in 1948, 1949 and 1953 by Topps and limned for a good couple of decades after that. 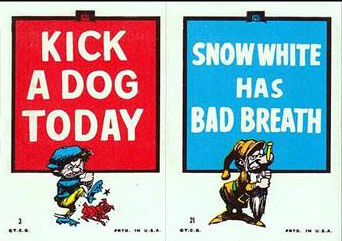 Click the tags over to the right to see - the 1948 ur-issue was the first Topps novelty set, issued 70 years ago. Anyhoo, while I have the uber-difficult round counter display canister the gum was displayed in as part of my collection (among other related goodies), I do not have the outerbox it resided in when shipped. A really, really nice one got away as it turns out, and at a pretty reasonable price. I think we can all agree clean fun is the best kind of fun! And who doesn't like a cavalcade? I just looked it up, a cavalcade is a formal procession of people walking, riding horses, or in vehicles. I guess the horse theme went with the overarching "circus" motif Topps had going on in 1948-49. Alas, nothing there we didn't already know. 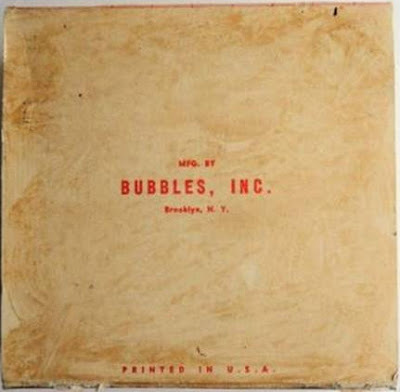 Topps used Bubbles Inc. on their non-core Topps Gum brands including Bazooka, until they phased out their former flagship product in tab from around 1949-50. 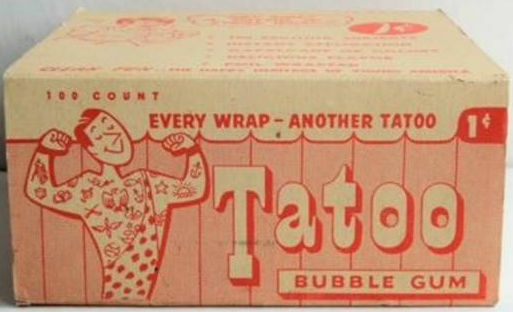 I believe 1948 Tatoo was the last product issued this way by Topps as they went to a square display after. While it's possible some of their 1949 issues came "in the round", I don't think they did-it squaresville thereafter man! Now can someone find me a scan of the 1948 Tatoo Tourist Pouch?! 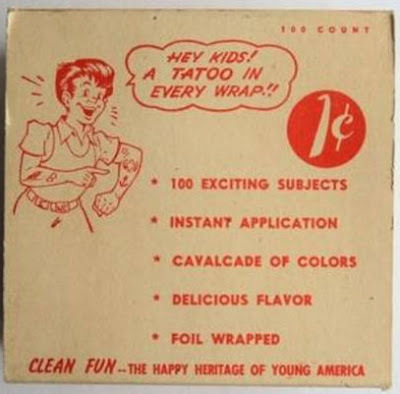 That was the 10 cent configuration used for kids parties as best as I can guess. 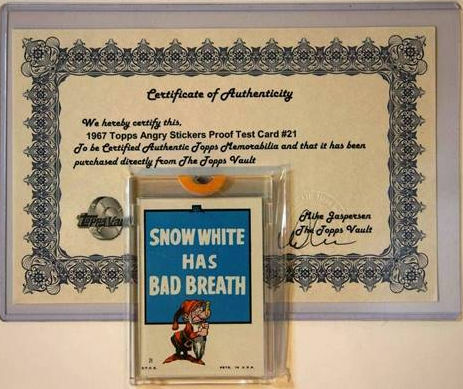 Not too long ago, some Topps test packs that had been auctioned by Mile High and dubbed the "Tennessee Beer Box Find" entered the hobby and yielded a lot of good information about how Topps distributed such things 50 plus years ago. 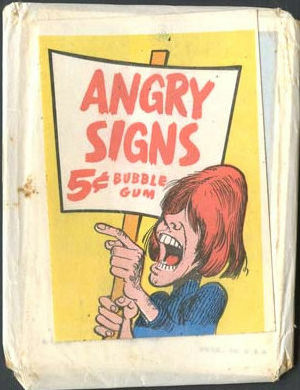 I covered that find in a post last year and hit up a few people that know about the really esoteric Topps stuff as I was trying to determine what was actually in the packs dubbed Angry Signs. Dubbed Insult Jokes, the example above appears to be nothing less than a take on the Dozens. 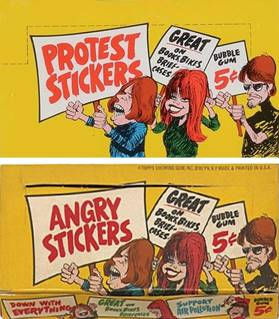 The problem I was having upon seeing this, was that this was an insert and possibly a sticker. I'd be curious if the paired stickers with one test subject also contain another test subject, which would get us somewhere toward a partial checklist of the former. More on this development another time!